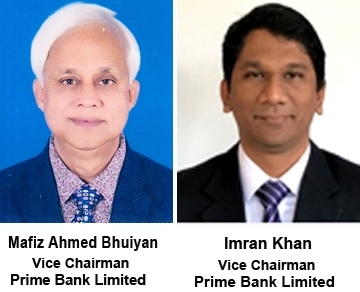 The Board of Directors of Prime Bank Limited in a recent meeting unanimously elected Mr. Mafiz Ahmed Bhuiyan and Mr. Imran Khan as the new Vice Chairmen of the Bank for next two years. Mr. Mafiz Ahmed Bhuiyan is a Sponsor Director of Prime Bank Limited. Mr. Bhuiyan is Managing Director of IPE Technology Limited, Shepherd World Trade Limited, Shepherd Consultant & Management Ltd. and Representative Director in the Board of Citizen Securities & Investment Limited (A full-fledged Merchant Bank) as Chairman. He is former Trustee/Life Member of Eastern University & South East University and Director of Australian International School (International Holdings Ltd.) As a Businessman, Mr. Bhuiyan can be termed one of the pioneers in the field of RMG in terms of setting up backward linkage industries in collaboration with reputed overseas companies belonging to developed countries. Currently Mr. Bhuiyan is member of the Executive Committee of the Board of Prime Bank and Chairman of Prime Bank Foundation- dedicated CSR wing of the Bank. Mr. Bhuiyan takes keen interest in Games and Sports and had been an active golfer until recently. Mr. Imran Khan, a promising business personality is a Director of Pedrollo nk Limited; a leading company engaged in import, sales and distribution of renowned Italian brand Water Pump ‘PEDROLLO’ in Bangladesh.In addition, the company also acts as a sole agent of renowned SAER, Itap, HCP and Rain Bird brand water pumps in Bangladesh. Mr. Khan is director of diversified business concerns like PNL Holdings Ltd., PNL Water Management Ltd., Halda Valley Tea Company Ltd., Halda Fisheries Ltd. and Hill Plantation Ltd. In addition, he is proprietor of Prima Enterprise, a trading house involved in import of various trading items. Mr. Khan is an Ex-Cadet of Fauzdarhat Cadet College, Chittagong and completed his post-graduation from North South University, Dhaka. [ Mr. Khan is member of numerous clubs and societies like Chittagong Club Ltd., Chittagong Boat Club, Shaheen Golf & Country Club and actively associates himself with various CSR activities. He is member of the Governing body of Lion Mukhlesur Rahman Foundation- a renowned NGO and Charitable Organization operating from Chittagong for the underprivileged and poor masses. Mr. Khan is currently a Member of the Executive Committee of the Board of Directors of Prime Bank Limited.